The phrase "smoke and mirrors" is often used to refer to the misdirection created during an illusion. Smoke works wonderfully for hiding the real action taking place during a magic show and adds drama to any trick. Magicians have a number of methods for creating smoke during specific tricks. An affordable and easy way for a magician to produce a smoke-like effect is to use dry ice. When the magician pours hot water over dry ice, the result is a billowing cloud of steam. This effect resembles actual smoke enough to suit the needs of most magicians. 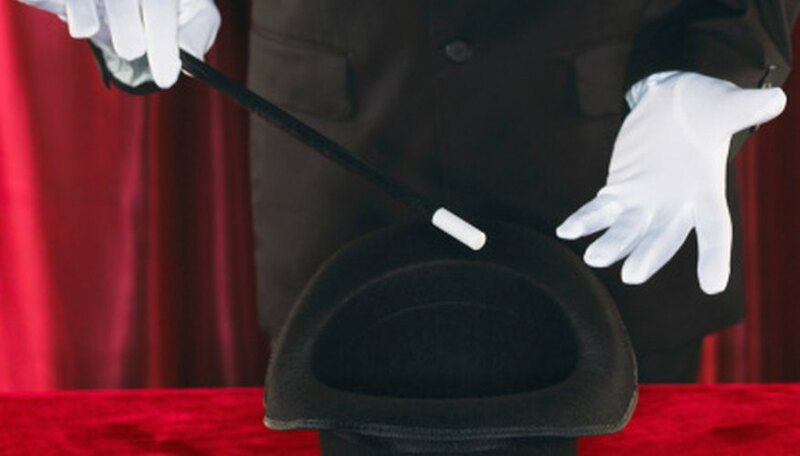 Better yet, it is affordable as well as safe in that it allows the magician to avoid the potential hazards and dangers of using actual pyrotechnics. Stage shows often make use of flash pots are to create dramatic bursts of smoke or light. These devices can be filled with various types of powders; to make a magic smoke effect, the magician loads the pot with a specialty smoke powder, available in a variety of colors. The magician then applies a current to an ignition wire, which generates a spark and in turn ignites the powder and creates the smoke. Flash paper is a highly flammable material composed of nitrocellulose. Magicians use a hidden igniter to spark the paper, which then vanishes in a quick and brilliant flame. The material is easy to manipulate, allowing the magician to cut or shape it into any form to work with a particular trick. Some varieties of flash paper produce more or less smoke, but combined with the flame, the overall effect is quite effective at creating flash and drawing the eye away from what's really happening. Magicians also sometimes use special pyrotechnic effects that create a puff of smoke when they throw a ball to the ground. Special pyrotechnic and magic supply companies sell these balls. The chemistry involved is such that people should not try to build their own. A mistake could result in a dangerous product, or in one that doesn't function at all. Most major magic supply shops have products of this type available.